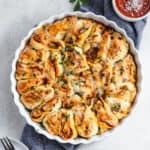 Meaty Pizza Rolls Recipe - Think Totino's Pizza Rolls but homemade delicious pizza in bite sized pieces! A delicious and super simple scratch recipe for game days or fun bite sized snacks for Friday nights! Make Napoli Inspired Pizza Dough according to the recipe. Next cut dough into two smaller balls. Roll each out to a large rectangle shape. Brush 1/2 cup of pizza sauce on each rectangle shaped dough. Add cooked sausage and pepperoni to each dough. Next, sprinkle cheese on each dough. Starting at the top of the long side of the rectangle, gently roll the pizza into a roll. Using a serated knife, cut the dough into smaller rolls and place in a baking dish sprayed with non-stick olive oil spray. Spray the tops of the rolls with olive oil spray and sprinkle on parsley to garnish. Bake pizza rolls for 10-17 minutes or until rolls are browned and cheese is melted and serve.